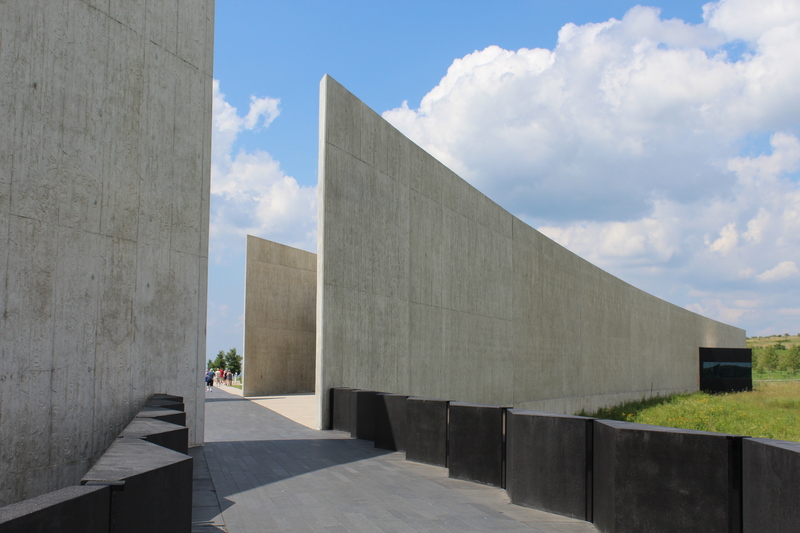 Flight 93 National Memorial (PA Parks Part 3) | Dorothy Ann Writes! The third park I visited on my mini road trip to Pennsylvania was the Flight 93 National Memorial. Unlike the Allegheny Portage National Historic Site (link to my blog post) or the Johnstown Flood National Memorial (link to my blog post), Flight 93 serves as a memorial to something that happened during my living memory. When someone says that to almost any American older than about 22, we know what they’re referring to. (Unless it’s your boss asking and it’s late September, then you might have missed a day of work.) For most of us, September 11, 2001 is a date carved into our memories. A terrorist attack, fear, and the beginning of a war. The feeling of being unsafe in our own country, our own homes, our own schools. I was wearing all black on September 11, 2001. It was my 6th grade science teacher’s 50th birthday and our whole class had conspired to wear black to ‘celebrate’ her reaching that milestone. My memory is a little fuzzy but a classmate’s father was supposed to be at a meeting at the World Trade Center- the same World Trade Center that we were called to the auditorium to hear about a plane crashing into. Fortunately, her dad hadn’t made his meeting for some reason. School was dismissed early and my parents came to walk my brother and I home. We almost never watched the news on TV, but we did that day. Planes crashing into buildings, evil men taking over flights of random citizens, and somewhere, some field relatively close to Washington, DC, a plane crashing in a field because the passengers stood up to the hijackers. Those brave random citizens stopped the plane from hitting its target, the Capitol. That was Flight 93, and almost 17 years after that all-black science teacher birthday, I was in Pennsylvania to visit that field. Flight 93 National Memorial is located in Stoystown, PA, about 3 hours driving northwest from Washington, DC or 1.5 hours driving east from Pittsburgh. It is really ‘in the middle of nowhere,’ when I was Googling to confirm the location the Memorial was listed as “#1 of 2 things to do in Stoystown” (the #2 of 2 is a gift store.) When visiting Flight 93 to learn more about this tragic and heroic event, you may want to bring snacks and water, as you will be at least 45 minutes from fast food or a grocery store. I’m not going to focus on the events of Flight 93 itself, because there are many (better-written) sources for that. This post will just be about my visit and the memorial itself. 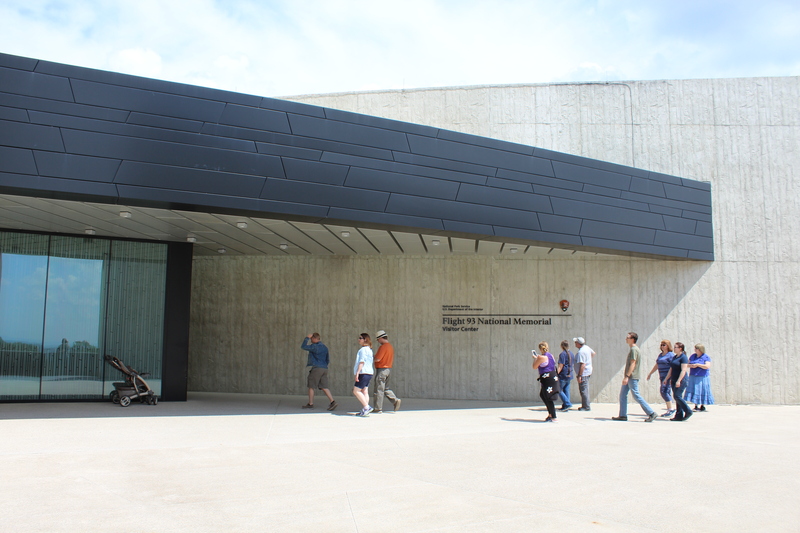 The visitor center is a striking building that looms over the landscape. The area where Flight 93 crashed was near a reclaimed coal strip mine, which is full of grasses and wildflowers today. I didn’t take any pictures inside the visitor center, but it is essentially set up as a museum, with displays of evidence and memorials, challenge coins and patches from the many emergency crews who responded, and heartbreaking audio recordings of passengers’ final calls. The visitor center has a platform where visitors can see the landing site, or they can walk or drive down to a memorial area. I chose to walk, and I don’t really know how to describe the feeling of hearing birds chirping and seeing beautiful flowers while walking along the flight path from such a horrifying event. On one hand, a calming sense of renewal: this space was a strip mine, then a tragedy, and now it’s home to a family of red-winged blackbirds. On the other hand, thinking about the tragedy and heroism put me in too somber of a mood to appreciate the flowers. I did have my camera, though, so I tried. The Memorial Plaza contains a wall with all the victims names. The plane’s crew are noted (but in this picture ‘flight attendant’ has been worn to invisibility.) Nearby is the crash site itself, marked by a large boulder. It is fenced off and only accessible to the victims’ families. I could have returned to the visitor center the same way I came, but the crowds were starting to bother me. For a non “National Park” NPS site in the middle of nowhere, this is a popular location, and I can see why. The “Allée,” or formal walking path, travels around the long way (if the Visitor Center is at 12 o’clock, the Memorial Plaza is at 9-ish) and contains 40 groves of trees. It’s about 2 miles long, so I thought that would be enough to clear my head and get ready for the drive home. This song by Neil Young was inspired by some of Flight 93 passenger Todd Beamer’s last, and it was on one of the CDs played as a soundtrack in my parents’ house when I was younger. I was so familiar with the song, and vaguely aware that it was inspired by 9/11, that listening to it as I walked along the memorial to Mr. Beamer and 39 others sent shivers down my spine. I took a last look back at the field and flight path, hopped back in my car, and headed home. Flight 93 National Memorial isn’t a fun or delightful place to visit. But it’s important. 9/11 was a major milestone in my life and in this country’s modern history. This memorial tells the story of ordinary humans taking the last few moments of their lives into their own hands, knowing they most likely wouldn’t survive, to prevent further horror and bloodshed. If you are able to visit, I recommend it. I do, however, recommend visiting with friends and family. I think processing the emotions and thoughts inspired by a place like this would be easier with others. Another addition is planned for the Memorial, a “tower of voices” installation with 40 windchimes to represent the 40 lives lost. It will be completed sometime this year (2018) and dedicated in September. I’m hoping to return. I posted this memory to FaceBook on 9/11/13. The World Trade Center and 9/11 Memories My father’s New York UARCO office was, for many years, at 200 Church St., in the winter’s afternoon shadow of the twin-towers. One of his office-mate’s father ran one of the massive construction cranes atop one of the towers while it was being built. Dad commuted via the PATH trains from Hoboken station as did I for about half of the 1970s heading into my Chemical Bank office at 20 Pine Street a short walk from the towers. One morning on the way to work, I watched a guy scale the outside of one of the towers using a device he built to slide in the tracks the window washing equipment used. Dad was there to witness the high-wire French guy walk between the towers 110 stories above Manhattan while they were being built. My neighbor down the street from me in Mendham, NJ was with Otis and in charge of maintaining all the elevators and escalators in the World Trade Center complex. He told me windy days were the worst when the towers flexed and tripped shut-down sensors in the elevator shafts. I walked through the Trade Center twice each work day from the PATH station at the deepest point under the towers, to my office and back again. About 20 parallel escalators whisked you from the PATH station up about six or more floors to a sub-basement shopping mall. The most spectacular memories I have are enjoying several dinners in Windows on the World, an exceptional restaurant atop the north tower. Incredible views of night falling over NYC while enjoying spectacular expense account dining. 200 patrons and employees perished there 12 years ago. The restaurant closed after the 1993 bombing. It underwent a $25 million renovation and reopened in 1996. In 2000, the restaurant reported revenue of $37 million making it the highest-grossing restaurant in the United States. When the first tower was hit, we turned on a TV in my lobby. I watched as the second plane impacted. I told my staff “we are now a nation at war.” An air conditioning repair guy walked into the shop and asked if he could watch what was happening with us. I said sure. After the first tower collapsed, the A/C guy’s phone beeped. He flipped it open, read a text message and announced, “I’ve been recalled to duty.” He was a recently discharged Army vet and was in the Reserves. Amidst all the carnage, I remember Mayor Rudy Giuliani’s incredible performance. He was in a close-by NYFD command post for fighting the tower fires when it was buried by a collapsing building. He spoke the following Saturday, with great eloquence, at the graduating ceremony of a class of newly-minted NYC firefighters. So many were lost just days earlier. Months earlier, while attending the funeral of a firefighter killed in the line of duty, the fireman’s daughter lamented that she was being married in a couple of months and she had no father now to walk her down the aisle. Mayor Rudy said to her, “If you wouldn’t mind, I would be honored to take your father’s place and walk you down the aisle.” He did on the Saturday after 9/11 despite everything else going on. My personal opinion is, I think SEAL Team Six let Osama Bin Laden off easy. Oh my gosh, I got shivers reading about the A/C guy being called to duty. Talk about a lot of sudden change in just an hour or two. Thank you for sharing.